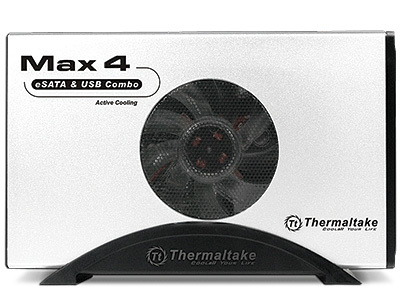 The Thermaltake Max4 eSATA & USB2.0 Combo 3.5" Hard Drive Enclosure with Active Cooling delivers maximum portability, maximum transfer speeds, maximum compatibility, and most of all maximum convenience! The sleek aluminum Max4 houses any standard 3.5" SATA hard drive in any capacity and is capable of both SATA and SATA II standards. It features both an eSATA and a USB2.0 port on the back allowing you the ultra high speed 3Gbps data transfer rate of SATA II, while also giving you the maximum compatibility of USB2.0 when on the go. The Active Cooling version of the Max4 features a built-in 80x15mm blue LED fan to keep your toasty hard drives running cool and stable. If you want a four way maximization of your data then look no further then the Max4 eSATA & USB2.0 Combo 3.5" Hard Drive Enclosure from Thermaltake!